As both a fan of poetry and audio books I wanted to highlight some of the poetry offerings of our downloadable audio book store. This month is National Poetry Month in the United States. This annual celebration of poetry was started back in 1996 by the Academy of American Poets. Inspired by other monthly celebrations like Black History Month the month of April was chosen apparently for lack of competition from other celebrations. A while back I posed a question about “Who Created Audiobooks?” and Chris Benson commented on the audio book industry considering Dylan Thomas’ readings of his poems as being the first official audio book recording. Poetry was meant to be heard with it’s rhythms and rhymes. 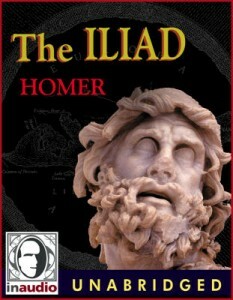 The audiobook format is great for producing works of classical poetry readings by notable narrators and full cast productions of classics like Virgil’s Aeneid and Homer’s Iliad. Listening to Milton’s Paradise Lost is also a feast for the ears and the soul. Poetry is a fundamental part of literature that may be in jeopardy as younger readers and listeners gravitate toward easier genres. This could be a function of the public educational system. Exposure is key to developing any kind of appreciation. Back in high school and college I remember many kids thought getting the Cliff Notes or short versions of books they had to study. It was a short cut to understanding what the books were all about, especially for longer books. When it comes to poetic works like the Iliad or Paradise Lost and even Shakespeare a lot of the meaning and understanding is relayed in how the book is read. Audio books help to understand how to interpret and read these types of works. Many readers don’t get Shakespeare until they hear it read by someone not hesitating because they don’t understand what is being said. In honor of National Poetry Month we have put up a coupon which will give you a 20% discount on all orders until the end of May 2010. Just enter coupon code poetry at checkout. Browse our collection of Poetry Audiobooks here.